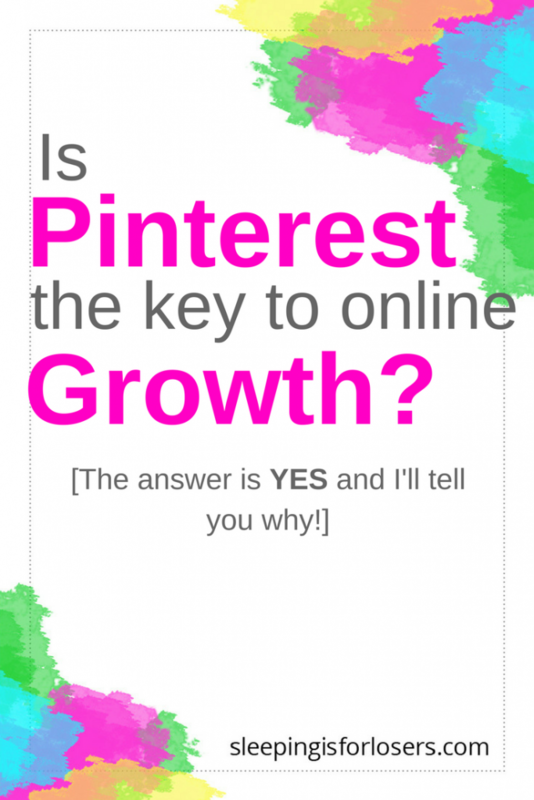 Is PINTEREST the key to online growth? That’s an excerpt from an email from a friend that was sent to me about 2 years ago. I read it, laughed about how dumb I thought Pinterest was, and went back to Twitter (where, quite honestly, I was spending most of my time and receiving most of my traffic from). I didn’t believe that Pinterest had real power. I thought it was for people who wanted to cook, reno their house, or make a fancy craft. I am none of those people. Nope, I am actually the furtherest thing from a crafty, DIY mom that you could imagine. So I decided the Pinterest was not for me or my blog. And then something interesting happened: I had a conversation on Twitter with a blogger who was getting 30,000 visits to her (barely updated) blog each month from Pinterest. And then another blogger chimed in and mentioned that Pinterest was also her biggest traffic driver. And then a start-up (in TECH!) mentioned the same thing. None of these people were DIY bloggers or crafty moms or foodies or anything like I imagined a Pinterest user would be. And they were all having really good success in simply PINNING onto boards. So now my interest was peaked. Being exactly who I am, I couldn’t let a conversation like that simply slip by without doing some true investigating into this whole “Pinterest” phenomenon. So, I decided to give Pinterest a one-month trial. An all-in month where I would actually make an effort to learn about Pinterest and dive deep into what it was that allegedly made Pinterest such a powerful tool for website owners in almost every single niche. And if I didn’t enjoy the platform after one month, or didn’t see any kind of improvement in my traffic, I’d give it up. Fair deal, right? What I found out may not shock you but it shocked the heck out of me. Are you ready for it? I can’t even believe that I am writing these words but I kid you not, as I am typing I have my real-time analytics open for my website (SleepingIsForLosers.com) and I have visitors RIGHT NOW on my site that found a blog post through Pinterest. Strangers to me and my site are clicking around and reading my writing because of one single pin that I threw up on Pinterest a week ago. So let’s take a few minutes and look at what I’ve learned and how Pinterest is working for me! To understand the power of Pinterest, you need to understand exactly what Pinterest is and how it can work for you. Pinterest is a FREE SEARCH ENGINE. It’s more like Google or Yahoo than Instagram or Facebook. People go on Pinterest because they want to find information or inspiration – they SEARCH for it. Pinterest also has a wicked smart algorithm that leads people the information they are looking for. It optimizes searches and provides people with a “smart feed” that pops up as soon as they log in. That smart feed gives people content that Pinterest believes they will enjoy based on their previous searches…and Pinterest is really good at getting it right! It’s the key to making Pinterest the search engine that it is. It’s the hub of all Pinterest activity and it’s going to be your best friend as we continue. Go ahead and type something in it (try “blog tips”) and see what pops up. You’ll likely see a vast number of images that have to do with blogging. Now, the next time you log into Pinterest, take note of what you see as soon as you log-in. That’s your smart feed…and I almost guarantee your smart feed will now be populated with posts about blogging because you searched for it! This is really where Pinterest differs from “social” platforms. Yes, you are saving and sharing content but you’re not interacting with the author of that content, creating conversations or truly engaging. Instead, you’re searching for the information you need and organizing it in a board so you can find it again when you’re ready to access it. RICH PINS (this is why you need a business account. Rich pins are really the only way to ensure your pins have the ability to have long, keyword-rich descriptions that help you get found when someone is looking for content like yours in the search bar). RELATED POST: New Mom-On-The-Go Survival Kit! 1) Get Yoast’s SEO plugin. 2) Find the “social” tab for this plugin. 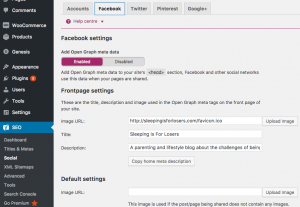 3) In the social tab, check “Facebook” and then “Add Open Graph meta data” at the top of the page. 4) Go to the Pinterest developer page to verify. 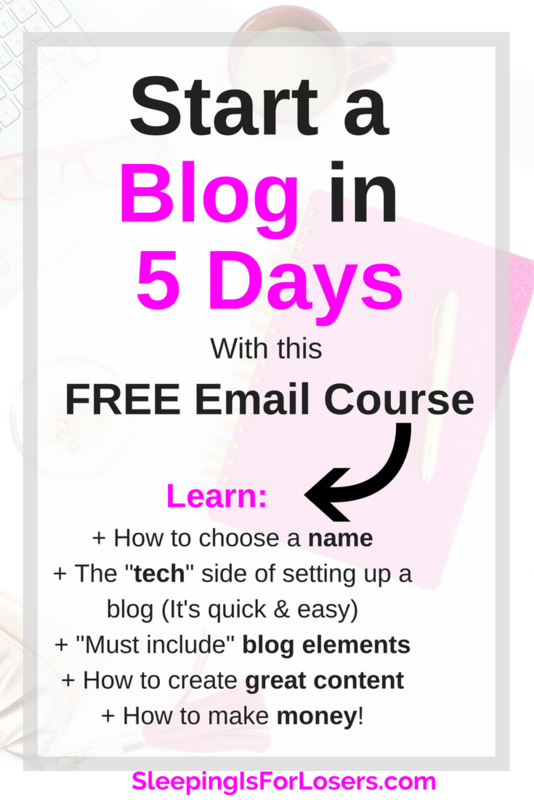 5) Enter valid blog post url. 6) Pinterest will tell you that you’ve been validated and to apply. Then they will review your application and send you your final approval. The best part about Pinterest is that there is actually no “trick” to getting it right – there is a formula that you need to follow but the main ingredient of that formula is CONSISTENCY. Once you start using Pinterest consistently, you will see visitors on your blog or website directly from Pinterest each and every day. You will see people joining your email list directly from Pinterest, each and every day! Sound good? Ya, I know it does! So, I know what you’re asking: what’s the formula to making Pinterest a success? Consistency + SEARCH WORTHY PINS + Organized Boards + Group Boards = Pinterest Success! In order to get Pinterest to LIKE, KNOW and TRUST you (the keys to a good relationship! ), you have to show up EVERY DAY. I know – that sounds like work. But it’s the key. Every morning I spend exactly 15 minutes on Pinterest, pinning to my boards. I set a timer, and pin content I like and would actually like to read (I don’t just pin everything that crosses my path). EVERY. MORNING. The other thing I do to ensure consistency is use BoardBooster. This was a huge game changer for me because I can set up BoardBooster to post my blog’s pins to the group boards I am part of. Using BoardBooster saves me hours each week and is worth every single penny I pay (but to be honest, it’s not very expensive when I look at the results it has given me!). With one month of consistency on Pinterest (January 2017, to be exact), I grew my blog views to well over 1,000 impressions a day from Pinterest alone. 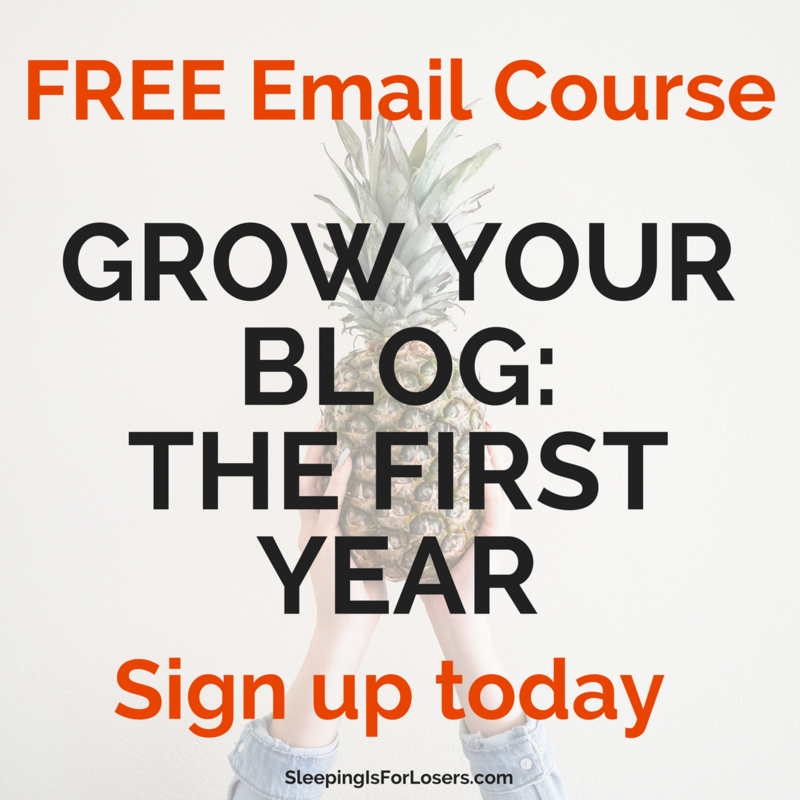 What’s more, I grew my email list by a minimum of one new subscriber each and every day. That is with only 30 days of consistency. Since then, I have grown my daily impressions to over 8,000 views (current as of March 2017) EACH DAY. H-U-G-E! This equates to a monthly reach of almost 100,000 views from Pinterest alone! Bananas! To start seeing similar results quickly, you need to ensure that your pins are “search worthy”. Remember, Pinterest is a search engine. I can’t say for certain that standing out from the crowd is the reason I am seeing so much traffic from Pinterest alone, but I can say that when you see one of my pins you know it’s from Sleeping Is For Losers and I think that is a very good thing. The next step is to make your pins searchable. You do this by DESCRIBING exactly what people should expect when they click on your pin! Blogging has the power to completely change your life. I went from being a teacher & mom to a freelance writer, newspaper columnist, national talk show host & brand consultant all thanks to my little blog that I started at my kitchen table! 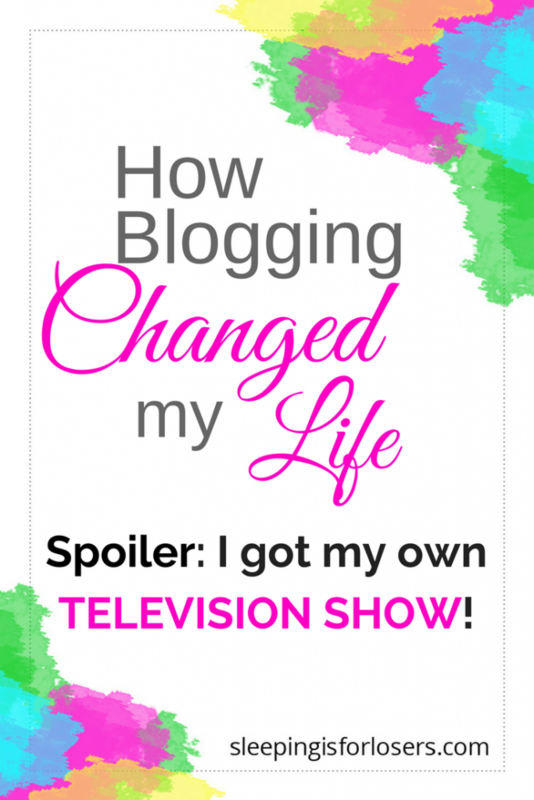 This is EXACTLY how blogging changed my life (and got me my own tv show). CLICK this pin to get all the details! Check out all the key words in that description: blogging, teacher, writer, host, brand, tv show, consultant, blog. If anyone searches any of those word in Pinterest, my pin will likely come up! In addition, I add a “call to action” at the end of my description. Always tell people exactly what you want them to do (ie: “click this link”, “save for later”, “pin this now!”, “pin for later”). I think it’s also important to mention that the content on my blog is good (#humblebrag). If people start to realize that every time they click on your link they get crap content or you’re trying to sell them something, they just won’t bother with your pins anymore. Make the clicks count, my friends! RELATED POST: Affiliate Income That Works For You! They are organized by topics that are interesting to me (important, since I’m on Pinterest every day!) and interesting to people would read my blog. Notice that my first board is all about MY OWN BLOG! You need to do this as well. Create one board that is only for you and your blog content! The rest of your boards, however, should be full of content that comes from others (with a few of your own pins mixed in there for good luck!). Again, you’re going to be using KEY WORDS that people may search (mom, blogging tips, party, parenting, writing, life hacks). Each board you create needs to have its own name and descriptions full of those key words! If you are a visual person, I’ve created a step-by-step tutorial for you to follow! 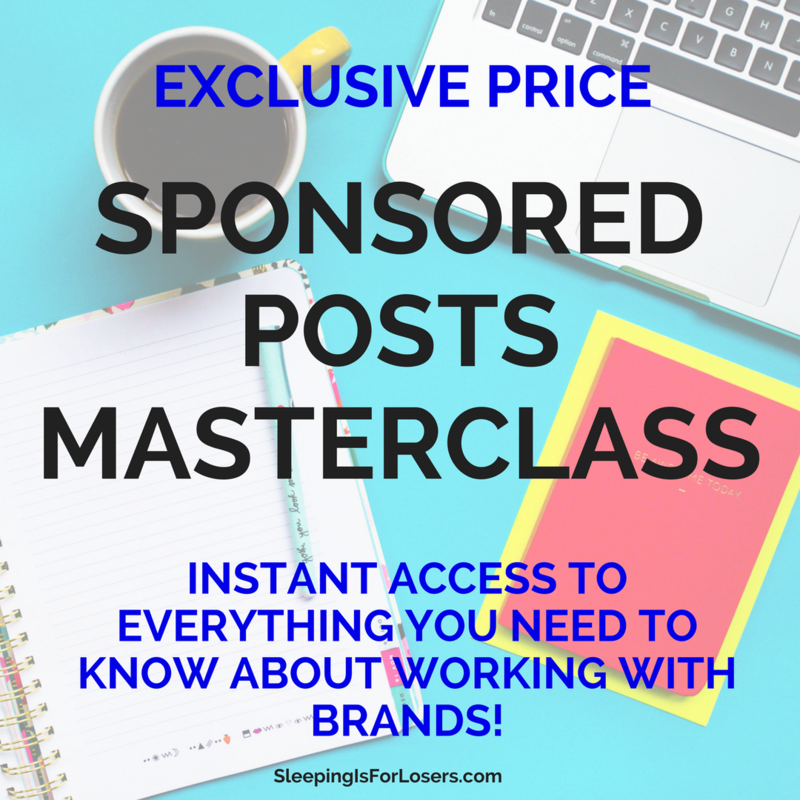 This is the final piece of the Pinterest success formula and it’s one that will take some time to get used to…but once you’re used to group boards you can see your traffic EXPLODE! It is much easier to join group boards than one would think, but be prepared to be ignored or get a “no” more than you get a yes. Here’s the key to finding group boards: RESEARCH (I know, so annoying). Look at people who write about similar topics to you and check which group boards they are in. Each group board will have its own specific way to join, however most will ask you to follow the creator of the group board AND email them to request entry. Once you have been accepted into the group board, you are able to start pinning your own pins for everyone on the board to discover. I personally pin directly from my “best of sleeping is for losers.” board. The reason group boards are so powerful is that your pins have the ability to be seen by literally thousands of others simply by including them on a group board. The bigger and more active the group board, the more your pins will be seen, repinned and (hopefully!) clicked on and read. Be sure to follow the rules of the board (most only want you to pin one pin per day and ask that you also return the love and pin from the board as well – which I do regularly as part of my online growth plan). If you’re more of a visual learner, I have a tutorial on how I set up my BoardBooster for great success! So I guess what I’m saying is that I have become a Pinterest convert. And I have developed a Pinterest formula that is certain to give you a significant following and daily traffic to your blog without feeling like you’re drowning in Pinterest…in fact, it’s quite the opposite. Once you start using Pinterest and seeing results, you’ll want to use it more and more and more and more! 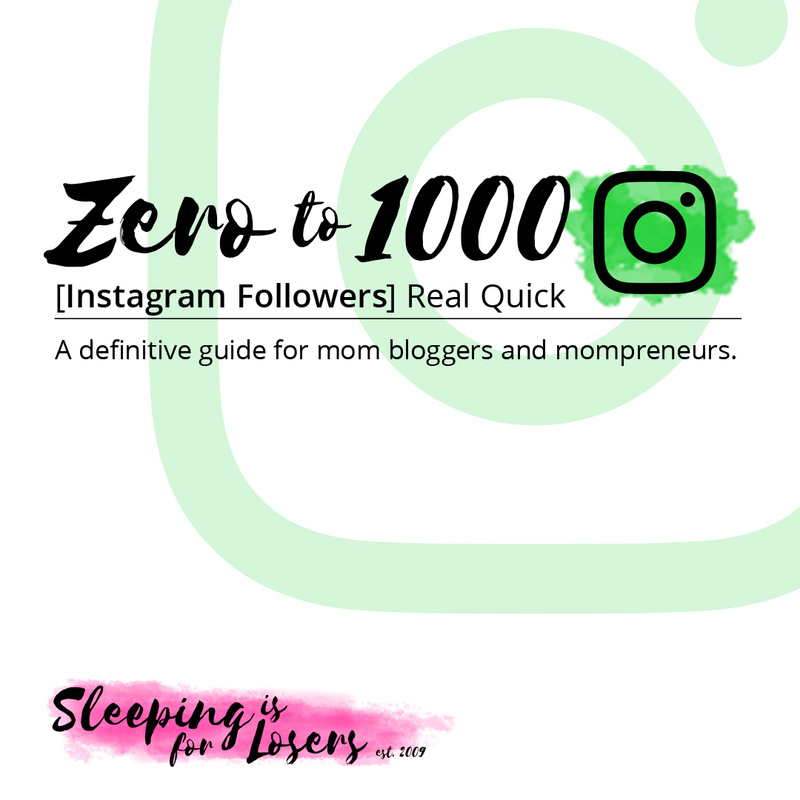 It has been such a huge traffic booster for me but even more importantly, it has given me the chance to “meet” other bloggers by putting their content in front of my eyeballs on a regular basis. I have signed up for email lists and started reading blogs that I never would have been in contact with prior to Pinterest. One last tip: RICH PINS are your best friend! Here’s how to ensure that you have RICH PINS (and yes it says that RICH PINS are for business but they’re actually for anyone! Get at it! Now!). Once you have your basic Pinterest account set up, it’s time to really dig in and see how you can make Pinterest work for you (and I mean WORK!). I highly recommend taking this Pinterest Traffic Avalanche course. It will changed everything about the way you use Pinterest (including how you make money!!) and the traffic you see coming to your website from one free social platform. This is the best course out there so grab it today!! Thank you so much Sarah! I’ve been so afraid of pinterest because I don’t get many re-pins. I keep hearing how amazing it is and want to dive into it. Is Yoast Premium required to do this? When I open Yoast on my wordpress I can\’t find a social tab. I only have General, Features, Your Info, Webmaster Tools, and Security. Nope! Just the free Yoast (I would never pay for the upgrade!). When you put your cursor on the SEO tab on the left hand column, there should be a pop-up menu that comes up that says “Dashboard”, “Titles & Metas” and then “Social” (followed by “XML Sitemaps”…). That’s the “Social” tab you need!! Let me know if you still can’t find it and I’ll send you a screen shot! Finally! I came across a blog post that made sense & easy to undertand Pinterest. I am at it and following all the tips you mentioned.